Every time I make a new chocolate cake, bar the odd disaster, I reckon it’s the best one ever. This one is no exception, but until they can all be lined up together and taste tested carefully, there is no saying how true this really is. Suffice it to say, it was jolly delicious. Two well risen, but moist chocolate sponges, made with pure cocoa are sandwiched together with a white chocolate and mascarpone filling and the top glazed with rich dark chocolate and honey. The contrast between the sweet filling, the bitter glaze and the not too sweet sponges makes this triple chocolate cake particularly satisfying. I used kefir to make the sponges, but buttermilk or sour milk would work just as well. I used a half wholemeal spelt, half plain flour combination and butter of course. For a dairy free cake I’ll use coconut oil or olive oil, which both work really well, but butter is always my preference. I was going to make a white chocolate buttercream for the filling as butter is the key ingredient this month, but I found some mascarpone which was fast approaching old age so I thought I’d better use that up instead. But fear not, I did use some butter in the chocolate glaze. Adding a little butter to a chocolate sauce or glaze right at the end usually gives a beautifully glossy result – my tip of the day. 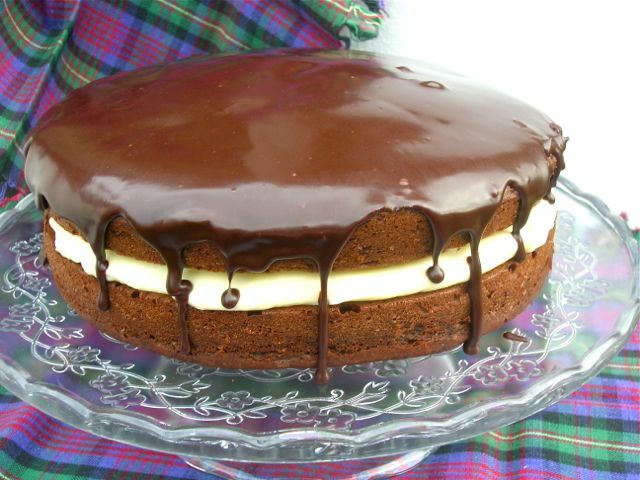 Chocolate sponge filled with white chocolate & mascarpone and topped with a rich dark chocolate & honey glaze make for a glorious Triple Chocolate Cake fir for any occassion. Cream the butter and sugars together until pale and fluffy. Beat in the eggs one by one. If the mixture starts to curdle, add some of the cocoa powder. Fold in the dry ingredients alternately with the wet ones until everything is just combined. Divide the mixture between two 21cm round silicone cake moulds (or lined tins) and level with a spoon. Bake at 180C for 35 minutes or until the cakes are well risen and shrinking away from the sides of the tins. Leave to cool for 10 minutes, then turn out onto wire racks to cool completely. Melt the chocolate over a bowl of hot water - it's important the water isn't boiling or even simmering or the chocolate might seize. Allow to cool a little. Stir the mascarpone until smooth, then stir in the chocolate. Spread over one of the sponges and place the other one on top. Bring the water and honey to a fast boil. Remove from the heat and allow to cool a little. Add the chocolate and leave to melt for a couple of minutes. Stir until smooth, then add the butter and stir again. Pour over the cake, allowing it to dribble down the sides a little. This cake is quite large and serves 10 generous slices or 12 slightly more refined ones. This triple chocolate cake is my entry to this month’s #WeShouldCocoa where the special ingredient is beautiful butter. 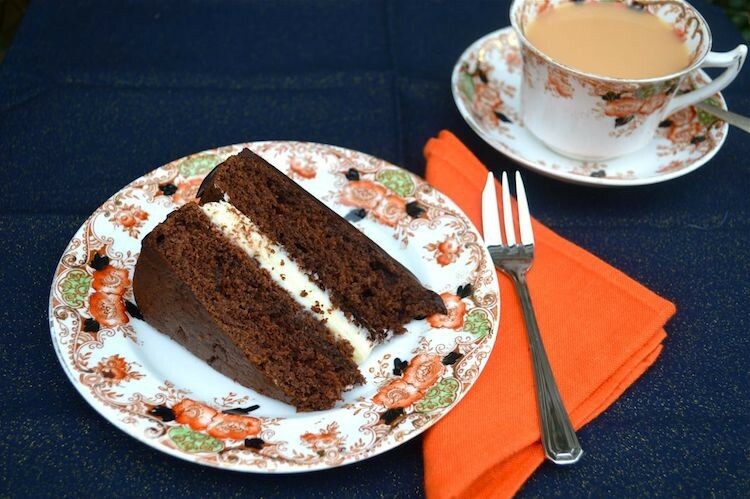 It’s The Month of Cake over at Jibber Jabber UK, so this goes to Love Cake too. It also goes to the No Waste Food Challenge over at Elizabeth’s Kitchen Diary. Whilst the mascarpone was still good, I wasn’t sure it would last much longer. Butter and chocolate are the perfect combination, love them together. I just want to dive straight into this cake! I am now drooling all over my desk – how is a woman supposed to write when this pops into her inbox?! This looks properly indulgent. I adore a good rich chocolate cake! Any left for me? Oh wow, this is making me very hungry! This cake looks delicious! Thanks Sophie. It really is a good one. Trouble is, I keep helping myself to “just another little slice”. Oh my word, what a stunning cake Choclette!! This looks so delicious, love the idea of a white chocolate mascarpone filling, genius. Will have a think about some We Should Cocoa ideas! That filling is just way to moreish Kate. If I hadn’t been trying to make a nice thick layer for the cake, I might have eaten a lot more than was good for me right from the bowl. Would be great to have you joining in with We Should Cocoa this month. What a fabulous looking cake, now I could just do with a slice of that and a cup of tea! Chocolicious and droolworthy comes to mind. Simply delicious!! Kelly you are so good. I think I need chocolate in my diet 😉 We usually have copious amounts of kefir in the house, so it gets used in all sorts of things. It works wonderfully in baking. oh my, oh my, oh my… i don’t even know what to say, but i want it and want it now!!!!!!!!!!!!!! Now that’s decadent. But I for one am very keen on a bit of decadence in the dark days of February. I love it. Hooray for a bit of decadence I say too. It all gets a bit boring if we’re too strict all the time – not that I can be accused of being too strict. I am totally drooling Choclette. That cake looks amazing and I’m now wondering why I haven’t finished on like that. Gorgeous! Thanks Jac, sometimes a full on chocolate cake is just what is needed – even if there’s no specific occasion to celebrate. Mmm! Yes please, this looks so delicious Choclette. I love how you’ve presented it so simply with the glaze trickling down the sides – it certainly makes it look incredibly inviting. I’ve never come across Kefir before, I guess I would find that in alongside the buttermilk etc in the fridge aisles of the supermarket. Thanks Angela. I’m a sucker for dripping chocolate, it somehow makes everything seem so much more inviting. I’m not sure how easy kefir is to buy. I think it’s one of those up and coming ‘health’ drinks. We’ve been making our own for many years, so often have an abundance in the house. Buttermilk would work fine. Soft airy sponge, luscious mascarpone filling, smooth chocolate glaze…this is a heavenly combo! Lovely luscious cake. I love the richness of mascarpone. Just so good with chocolate! Love the look of this cake too! Thanks Alida. Mascarpone is a great foil for chocolate, I should really use it more often. This looks gorgeous – don’t think I’ve had white chocolate in a cake before! Thanks Cathy. I’ve tons of recipes for white chocolate in and on cake, but this particular filling was a first. ‘Voluptuous’ is very apt! That’s a serious chocolate cake, but one which I could happily scoff straight from the serving plate. I think I prefer the decadence and richness of mascarpone against chocolate (given a choice) so maybe that was a fortuitous fridge find! What a delicious cake, I could easily eat a couple of slices . Haha, even I might struggle at two slices Nayna, it’s quite rich. Yes please all round! Just a single layer would make me happy but with three I would be ecstatic! What a stunning looking bake! I could quite happily scoff this any day of the year! Thank you for sharing with the No Waste Food Challenge!